The 550-ton, frictionless Magnitude unit is 40 percent smaller and 47 percent lighter than traditional centrifugal chillers of similar capacities. This compact size makes it ideal for retrofit projects or new installations where space and access are limited. 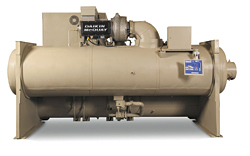 The chiller features a positive-pressure, oil-free design and is sustainable through its operating life because there is no oil to contaminate the refrigerant and degrade efficiency. The chiller uses R-134a refrigerant, so it has no ozone-depletion potential or phase-out schedule.